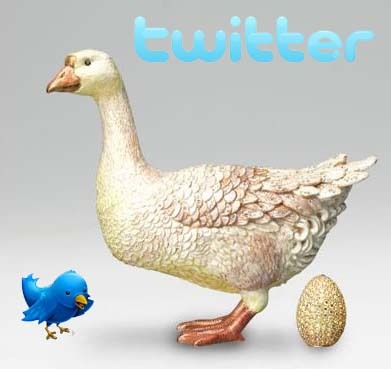 Would Hotels take Twitter more seriously if the Social Media giant had chosen the 'Goose That Laid The Golden Egg' as its logo instead of that cute little bluetit? I ask because midway through some extensive research that iVisitorGuide is conducting on UK Hotels and their use of Social Media we are consistently hearing the same feedback. And it's rather worrying! We 're currently surveying 3, 4 and 5 star hotels across the country and asking some simple benchmark questions about the extent of their current Social Media activity. What is clearly emerging is an attitude that effectively means "Social Media is something we are looking at - but not for another 6 months or so". This is the response from nearly 65% of the respondents to date. It's madness! The return on Social Media engagement takes time to achieve, there are no instant successes. You don't just switch Social Media on and lo and behold you instantly get lots more enquiries. IT TAKES TIME. Any business that takes the decision to delay their Social Media activity now will effectively wipe out any chance they had of making Social Media work for them throughout the whole of the 2012 season and well into 2013. An effective Social Media strategy will raise conversion rates, drive targeted traffic to your website and reduce customer acquisition costs. Why wait to do that? If you wait another 6 months you will miss this season completely and possibly next season too! Finally if you want help from someone who can manage this for you and deliver you some real results then please contact me.